In the latest quarterly update of the Energy Efficiency Trends report, which includes views from businesses for Q3 2017, EEVS Insight and Bloomberg New Energy Finance found that subsidy or policy uncertainty had grown among those surveyed. While demand for energy efficiency technologies remained the principle concern amongst suppliers, the report points to the possible impact of both Brexit uncertainty and a lack of ambition within the government’s Clean Growth Strategy as to why confidence in legislation remains low. And responses to this round of surveys appear to substantiate that lack of confidence. Just 11% of respondents said they considered current energy efficiency policy to be effective, compared to nearly 60% that concluded it not to be. Matthew Farrow, executive director at the Environmental Industries Commission, said that he believed government ministers were “struggling for ideas” on how to overcome the “perennial challenges” of energy efficiency policy. “The industry feedback gives a clear message - the Clean Growth Strategy target for energy efficiency lacks ambition, existing policies should be toughened up and tax incentives, EPC and ESOS reform should be considered,” he said. Levent Gurdenli, senior associate at law firm Bird & Bird, echoed Farrow’s sentiments, arguing that while the focus on energy efficiency in the CGS was positive, industry feedback had made it clear the targets could be more ambitious. “We need to build on the momentum generated by the Clean Growth Strategy to ensure the government considers the full range of measures needed to implement a coherent energy efficiency policy that delivers results, whether that be through tax incentives, reforming ESOS, the standardisation of energy efficiency or otherwise,” he added. But while broader confidence appeared low, solar PV remained ahead of the curve. 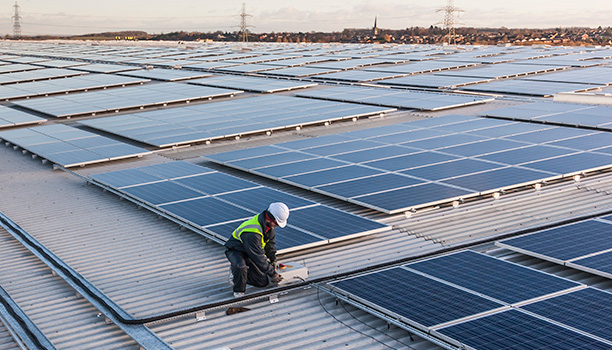 Around 20% of corporates who responded to the survey said they had commissioned solar PV projects, making it the most popular on-site generation technology of those included. It will also be encouraging to see average payback periods for corporate investment creeping up – at just over four years, they are currently at their highest in more than three years – indicating growing appetite for more expensive measures.